Trichomonas vaginalis is a common cause of vaginitis. The trophozoite (shown at right, Giemsa stain) measures about 15 x 10 µm. The auxostyle (arrow) is often clearly visible. 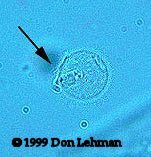 The trophozoite has a single nucleus and four flagella. The undulating membrane is sometimes visible and extends about halfway down the side. 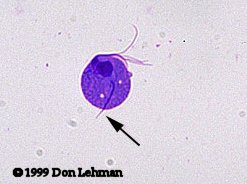 Trichomonas spp. do not have a cyst stage. T. vaginalis infections are generally diagnosed by examining wet-mounts of vaginal discharge. It is important to examine these samples soon after collection so that the parasites are still motile. It is easy to confuse nonmotile T. vaginalis with WBCs. In the image on the left, the flagella (arrow) are just discernable.